American Samoa celebrates Flag Day, the day in 1900 when it became an American territory. It was formerly Eastern Samoa. Located in the South Pacific, the island group (according to the CIA World Factbook) is about the size of Washington, DC. About 55,000 people live in this tropical territory. Tuna fishing and tuna processing are a large part of its economy. Pago Pago is the capital. Syria celebrates Independence Day. Liberated from France in 1946, this Middle Eastern country is about the size of North Dakota. Farmers grow cotton and grains on its arable land. Mountains and deserts form a good portion of its geography. About 22.5 million people live in Syria, and its capital is Damascus. Giovanni Verrazano discovered New York Harbor in 1524. An Italian, Verrazano was in France’s employ when he found the harbor. He was trying to find the Northwest Passage from Europe to Asia. Hershey Bar was first sold in 1895. Before Milton Hershey, chocolate was very expensive, but his methods of candy making allowed the average customer to buy a candy bar. Idea: how about S’mores? Jerrie Mock in 1964 became the first woman to fly solo around the world. She left Columbus, Ohio, on March 19, 1964, in The Spirit of Columbus. She returned to Columbus 29 days later. She made 21 stopovers and traveled 23,206 miles. She received the Louis Bleriot Medal from the Federation Aeronautique Nationale. Children can learn more at: Jerrie Mock. They could also read The Jerrie Mock Story: The First Woman to Fly Solo around the World by Nancy Roe Pimm. 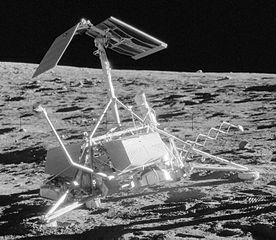 Surveyor 3 was launched in 1967. It made a soft landing on the moon on April 20, 1967. Astronauts from the Apollo 12 mission to the moon brought back parts of the Surveyor. Children could analyze this photograph of the Surveyor. They could find out how it worked and how it was able to land without sinking into the moon’s dusty surface. 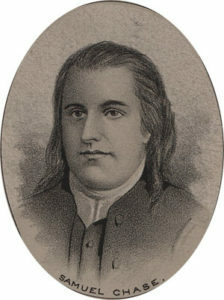 Samuel Chase (born Somerset County, Maryland, 1741; died Baltimore, Maryland, June 19, 1811) signed the Declaration of Independence. He represented Maryland. He also served on the Supreme Court as an associate justice from 1796 until he died. Martyn Godfrey (born Birmingham, England, 1949; died St. Albert, Alberta, Canada, March 10, 2000) wrote at least 30 fantasy and science fiction books for children. His books include More than Weird and the Ms. Teenie-Wonderful series. John Pierpont Morgan (born Hartford, Connecticut, 1837; died Rome, Italy, March 31, 1913) was a financier and corporate executive. He helped finance American Telegraph and Telephone, and he reorganized several railroads after a panic in 1893. He enjoyed collecting art, and his collections were often loaned to the Metropolitan Museum of Art. Idea: Children could brainstorm a list of famous paintings. Each could then create a fictional personal art gallery of his/her favorites. Thornton Wilder (born Madison, Wisconsin, 1897; died Hamden, Connecticut, December 7, 1975) was a playwright and novelist. He received a Pulitzer Prize in 1928 for his novel, The Bridge of San Luis Rey. He also won Pulitzers for his plays, “Our Town” and “The Skin of Our Teeth.” Children can learn more at: Thornton Wilder.